An honest review of my EP from boutique UK blog SoulandJazzandFunk – these guys are soul purists! 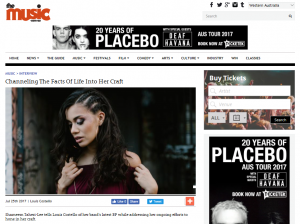 SHAMEEM (TAHERI-LEE) is an Australian soul singer/songwriter based in Perth. She impressed the soul world with her 2014 long player, ‘The Second City’. Connoisseurs grew particularly fond of her Alicia Keys-flavoured ‘Beautiful Soul’. 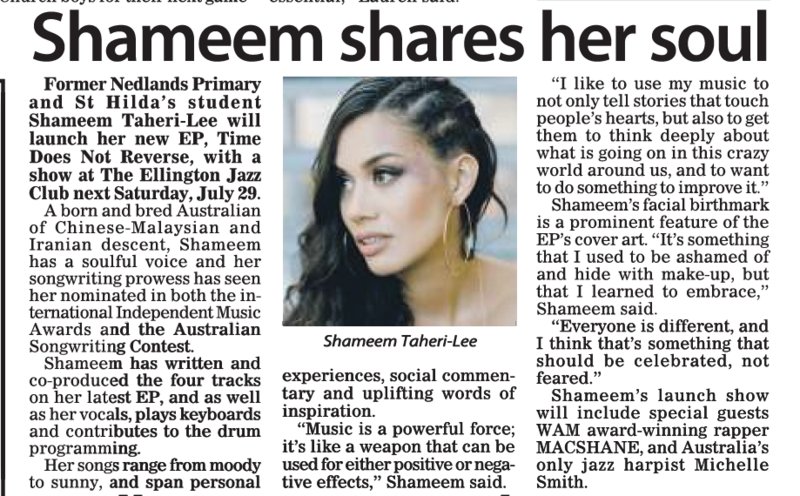 Shameem is now set to follow that up with a four track EP, ‘Time Does Not Reverse’ that wins release at the end of July. The lead single, ‘I Love You But’ has just become available and if you can get past the odd electro intro you’ll discover a fine contemporary soul tune with great lyrics about loving, but not liking someone! The EP’s other tracks are the lazy, jazzy ‘Just A Show’, a quirky ‘Moderation’ and ‘Pass It On’ – a lovely, simple, sweet. old school pop-soul ballad with a killer hook in the chorus. http://www.shameemmusic.com/wp-content/uploads/2017/05/Shameem_logo_reversed_bi-line-383.png 0 0 shameem http://www.shameemmusic.com/wp-content/uploads/2017/05/Shameem_logo_reversed_bi-line-383.png shameem2017-08-14 07:53:272018-03-08 07:56:44SoulandJazzandFunk - NO REVERSE! Nice little write up in the Post newspaper this week. The lyrics for “Moderation” are here. We live in a world of extremes. There is no shortage of groups of people in the world who oppose each other. Everyone has an opinion, which they’re entitled to, but so many people are holding onto their opinion so tightly that this clouds their vision and prevents them from considering objectively another point of view, and being willing to revise their opinion in light of new information obtained. What’s more, because this is the case, increasingly people pre-judge and box others who may be inclined to a different ideology or occupation or even fashion sense to themselves, and assume that others are “against” them. You’re either “for us” or “against us”. You have to be either anti- something or pro- the same thing. And if you are pro the thing that I am anti, then we can’t get along, and vice versa. Why can’t we find moderation, that is moderation?